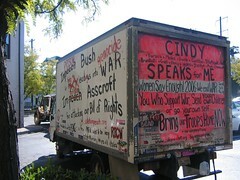 So, the Code Pink truck made its way across the red states without being fire bombed! My Stickley Bros. dining room table, couch, futon and toasterwave, among other things, are here. And get this: My incredible timing means that this stuff already has been moved into my new digs. So no need to make a second move and no need to ever deal with those biatches at U-haul.